A victim is wheeled out of the Bataclan concert hall Saturday morning after a series of deadly attacks in Paris. -- The first casualty was a person standing near a suicide bomber outside the Stade de France. As the attacks unfolded, there were multiple explosions — which authorities describe as suicide bombings — outside the national soccer stadium. The French national team was taking on Germany at the time of the blasts, with French President Francois Hollande in attendance, and multiple explosions were audible from within the stadium. Law enforcement officials in the U.S. and France told NPR's Dina Temple-Raston that the increased security detail because of the president's presence may have dissuaded the attackers from trying to enter. 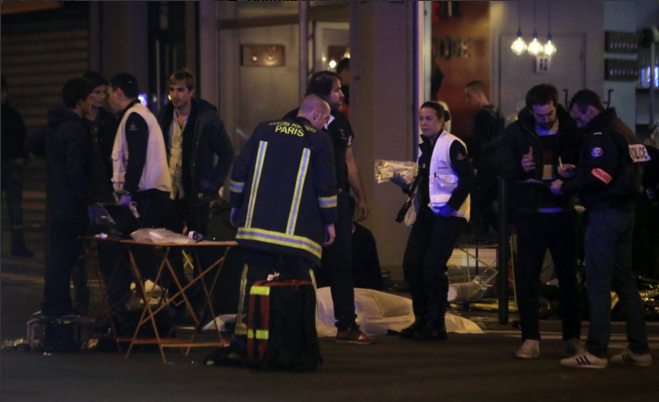 -- Next, more bystanders were killed on the sidewalks outside at least three restaurants in central Paris, in an area one writer described as "proletarian and ethnically mixed," and with nightlife that typically attracts city dwellers rather than tourists. The onset of the weekend, combined with the high-profile soccer game being televised, likely meant bars and restaurants were very full. -- Scores more people were injured, dozens severely, in attacks across the city. 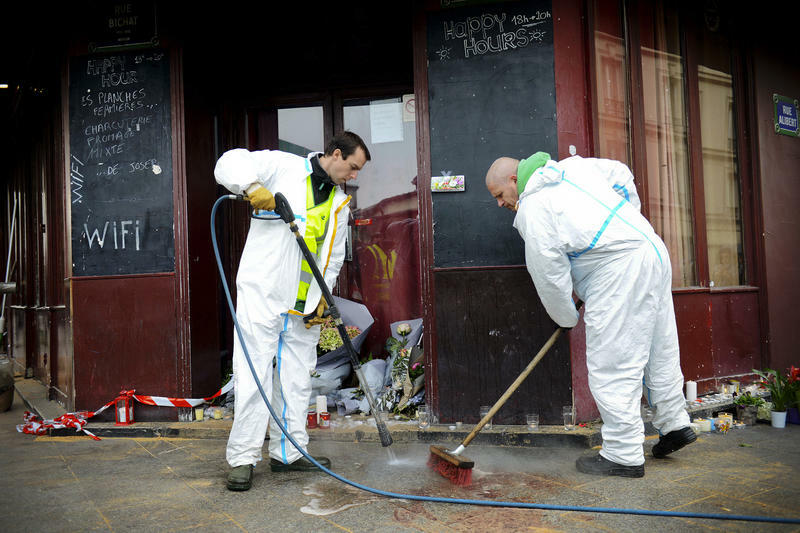 -- Twenty minutes after the initial attack, 89 people were massacred at the Bataclan, a concert venue where the American rock band Eagles Of Death Metal was playing, Paris' prosecutor said Saturday evening. Witnesses reported a horrific scene as multiple gunmen fired into the crowd and audience members scrambled for cover or an exit. Witnesses say the gunmen shouted "God is great" in Arabic and ranted about Iraq and Syria. French authorities said the gunmen eventually turned the attack into a hostage situation that ended after several hours, when anti-terrorist police stormed the hall and ended the siege. -- The death of American Nohemi Gonzalez, a college design student who was spending a semester studying in Paris, has been confirmed by California State University Long Beach. -- Other Americans are among the injured. 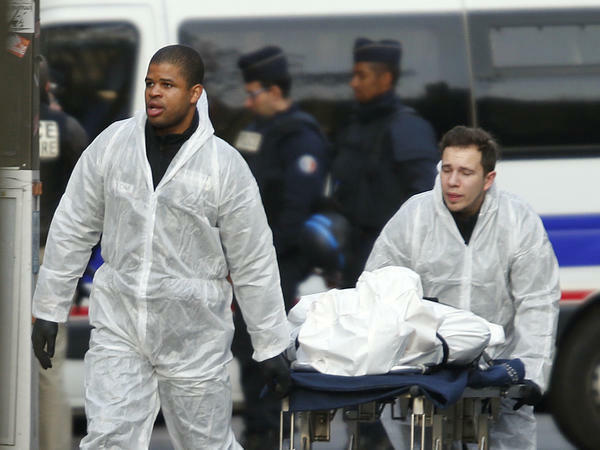 The U.S. government "is working closely with French authorities to identify American victims," says the State Department's deputy spokesman, Mark Toner. He says the embassy is working to help Americans who were injured. -- At least one British citizen died in the attack, the BBC reports. Citing Britain's Foreign Office, the news agency says "there could be a 'handful' of other British fatalities." — Hollande is calling the attacks an "act of war" committed by the Islamic State. -- Shortly after Hollande spoke, ISIS released a statement saying it was behind the attack, and that eight suicide bombers had been involved, according to SITE Intelligence, which monitors jihadist groups. -- Some of the attackers were killed when police stormed the concert venue in order to end the hostage situation, French authorities say. -- The attackers' weapons included automatic rifles and explosives, likely deployed as suicide bombs. -- Law enforcement officials tell Dina that the coordination of this attack is beyond anything shown by the so-called Islamic State or its affiliates so far. -- A Syrian passport that was found with one assailant was recorded as passing through the island of Leros, according to reporter Joanna Kakissis, citing Greece's deputy citizens' protection minister Nikos Toskas. The deputy minister says someone holding that passport passed through Leros on Oct. 3, and that the country is unsure where else he might have traveled. -- Several raids were carried out in Brussels on Saturday, and at least three arrests were made, in an operation that officials say is linked to the Paris attacks. Belgian newspaper The Last Hour reports that police targeted three young people who may have been involved. Paris prosecutor Francois Molins says a French citizen rented a car in Belgium that was used in the attacks — and that he was later seen in a different car. The man was arrested today. -- Authorities identified one of the assailants at the music hall as a young Frenchman who was born near Paris and was known to the authorities, according toLe Parisien and other news outlets. Paris prosecutor Francois Molins said the identified attacker had been found guilty of prior crimes and was regarded as "radicalized" by French authorities. -- Le Parisien adds that at the stadium attack, police also found two passports — one Syrian, one Egyptian — near the assailants. Officials have said that they believe all the attackers are dead, although accomplices might still be at large. -- Bavarian police say a 51-year-old man who was arrested on Nov. 5 is linked to the attacks in Paris. He was stopped at the border crossing with Austria, driving a car that contained explosives and weapons "hidden away in compartments within the car," NPR's Soraya Sarhaddi Nelson reports, citing local media reports. German public radio says "the guy had documents that suggest he was in fact linked here to the Paris attacks," Soraya says, adding that before he was arrested, the man had evidently been heading to Paris. -- An additional 3,000 soldiers are being deployed by Tuesday, bolstering the Operation Sentinel home security force that already numbers 7,000. More than 1,000 French soldiers were deployed across Paris on Friday night. "We are at war," says Prime Minister Manuel Valls. He adds, "And this war, we will win." -- A moment of silence is scheduled for noon on Monday. That same day, schools will reopen, officials announced Saturday afternoon. -- Public demonstrations are barred from taking place in the Paris area until Thursday. -- France's soccer federation says that the national team's next scheduled game, on the road against England at Wembley on Tuesday, will go ahead as planned. -- On Saturday, hundreds of Paris residents were lining up to donate blood and looking for other ways to help those affected by the attack. Friday night, a social media campaign called for people to "open doors" to anyone needing shelter in the city. -- President Hollande declared three days of national mourning and ordered that flags should be flown at half-staff. He also enacted tighter border restrictions, although airports were still operating with increased security and Eurostar train service continued. -- Hollande "vowed to be 'merciless' with the nation's foes," in a statement Friday night, the Associated Press reported. -- Much of France's subway system is now running normally, reports Le Monde. Earlier Saturday, the subway was shut down. -- The city government reported via Twitter that almost all city facilities and offices would be closed on Saturday, including museums and libraries. The Eiffel Tower, the Louvre Museum and other tourist sites were also closed, and the streets were relatively empty. -- With the closure of the subway, there were reports that French taxi drivers were offering free rides, and a hashtag circulated on Twitter offering safe places to stay to those stuck on the streets. -- Responding to the attacks, a Charlie Hebdo cartoonist drew simple images of a man speaking. In one sequence, he states, "For centuries, lovers of death have tried to make us lose the flavor for living. They never succeeded." -- In a televised speech, President Obama called the attack "outrageous" and pledged U.S. support to France. He reiterated that offer in a later phone call with Hollande. -- Fans of Eagles Of Death Metal — the band that had drawn a sold-out crowd to a show that ended in horror Friday — are relieved to hear that the band members of are safe and accounted for. A member of the California-based band announced they had regrouped, after being split up in the confusion. -- Other reactions in the U.S. include those by elected officials who are divided predictably along party lines, reports NPR's Domenico Montanaro. Democrats will have a high-profile chance to offer their thoughts on the attacks tonight, thanks to a previously scheduled debate at 9 p.m. ET on CBS. -- U.S. law enforcement officials say they know of no specific, credible threats against any U.S. sites, but security has been stepped up in major cities. Governments and officials from around the world condemned the attacks, moments of silence were observed at several other international soccer matches and sporting events, and many major buildings and monuments were lit up in French colors — though some images circulating on social media were taken days or years earlier. US and French warplanes struck back at ISIS, targeting its self-proclaimed stronghold in Syria and the oil trucks that provide much of the terror group's cash. France also identified a Belgian national as the mastermind of the Friday night attacks in Paris. EDITOR'S NOTE: Sacha Ott, 25, is a software engineer from France who lives in Paris. I will try to explain to you how I lived yesterday night. 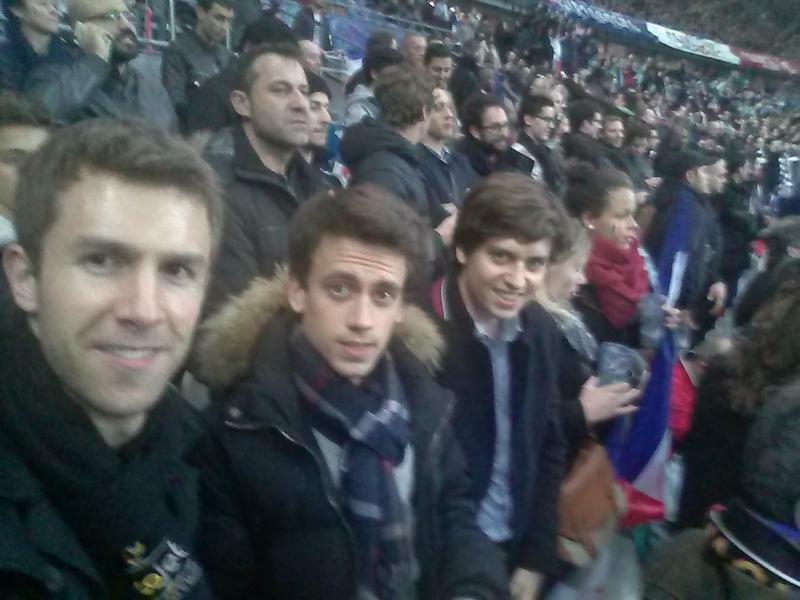 I was at the France stadium with two of my friends to see the France-Germany soccer match. At 9 p.m., you would have seen the three of us smiling, in our element. A few minutes after the match started, a loud sound happened. It seemed just below us. Then there was a second one and a more distant one after that. At the moment, I thought it was okay, it was probably a firecracker set off by fans. The morning after gunmen and explosions left at least 128 people dead and hundreds more wounded in Paris, ISIS has released a statement claiming responsibility for the attacks, according to jihadist-monitoring group SITE Intelligence.